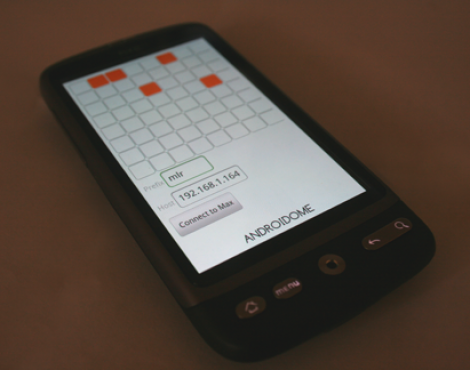 [Ewan Hemingway] tipped us off about his new Android app, Androidome. This is the first one he’s turned out after going through our Android development tutorials. It combines an app running on his Android 2.1 device with a computer running Max/MSP 5. The two don’t needed to be tethered, they just need to be on the same wireless network. This won’t be the best solution if you’re doing live performances, as the buttons on the screen end up being quite small. But as you can see after the break, it’s a great way to get into working with the Monome interface and decide if you want to build a dedicated physical version of the tool. very cool, thanks for the source. So it’s a random noise generator – or what? at the core of it, the monome project is just a matrix of buttons, that are defined by the software patch you run. for example, you can use it with Ableton Live to cut up/queue/play samples. this is cool because it lets you play with the concept without buying/building the hardware. Ah…thanks for the info (apparently it was too much work to describe or put some background info into the hack description). – Why not? Do you have some sort of insider live PA knowledge or are you blowing wind? I’ve seen plenty of folks spewing music with smaller devices. of course, i’d personally prefer the large tactile interface, but . . i can’t claim that it is the ‘best’ solution. 1. It destroyed my battery life. I’m ok with that. 2. You need to press enter when changing the patch to submit the change. Pressing “Connect to Max” does not do it. 3. Start with monome_test.mxb from http://docs.monome.org/doku.php?id=app:monomebase to make sure it is working. Yeah its not really *that* ideal for live playing. Multitouch seems limited to 2 simultaneous touches on my HTC Desire, but I struggle to fit more fingers on the screen anyway! People might be useful as a secondary sequencer/arpegiator though, to complement a physical monome? Once Android tablets start coming out, that’s when the real fun begins!